It was back in September, even before the iPhone X had hit the shelves, that we first heard about a potential 6"+ iPhone with LCD display, coming our way this year. 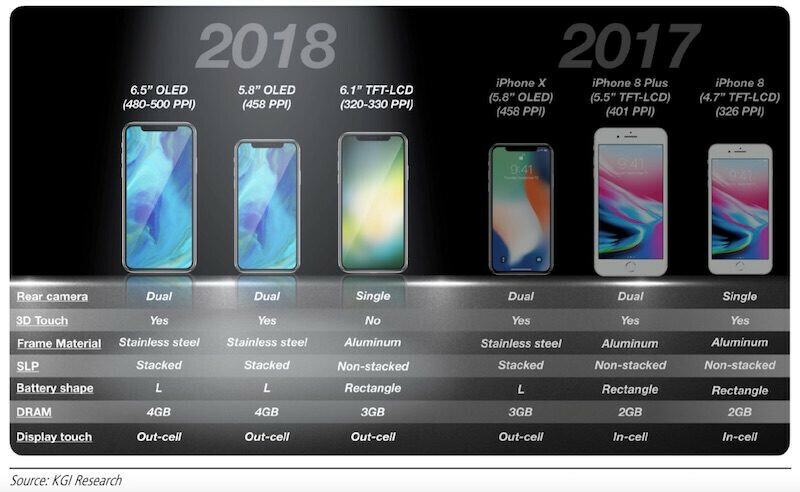 Previously, even famed Apple analyst Ming-Chi Kuo, had tipped that Apple will pull its OLED iPhone schedule forward a year, and all 2018 models would be equipped with such panels, out of Face ID, notch, and "all-screen" design considerations. Apple, however, reportedly scrapped plans for a smaller, 5.28" iPhone for this year, and replaced it with a 6.1" LCD model, as it rightfully concluded that people have moved on to larger displays with minimum amount of frame width around them. This expected 6" iPhone 9 is reportedly going to land as the gateway model to the Face ID experience this year, at a $700 price, cheaper than the eventual 5.8" iPhone X heir, and its rumored 6.46" Xs Plus sidekick, both of which are said to come with OLED displays. We couldn't help but wonder what may have prompted Apple to stay on the LCD bandwagon for the iPhone 9, and how would it incorporate the notch required for the TrueDepth camera in the rigid backlit LCD tech. Then came the Wall Street Journal report that Apple has partnered with Japan Display (JDI) on screens for a 2018 iPhone model, and it all became clearer. About a year ago, JDI announced that it has cracked the code on how to make a display that is flexible like OLED panels, but is made with the cheaper, more widespread LCD technology. Until then, Samsung and LG had a monopoly on flexible screens, and Samsung has even been utilizing them in popular phones from the Galaxy S6 edge onwards. JDI managed to swap the glass substrates for plastic, and said that the screen can be bent out of shape enough to achieve the "edge" effect of some Samsung phones at a much lower cost. That certainly means that it can accommodate Apple's "notch" cutout that houses the TrueDepth camera kit responsible for Face ID and Animoji, so the team from Cupertino must have paid attention to the announcement. As you can glimpse from the video below, JDI's panel certainly looked flexible enough for the part, and it has been improved on since as good enough to land in the "all-screen" Xiaomi Mi Mix 2, too. 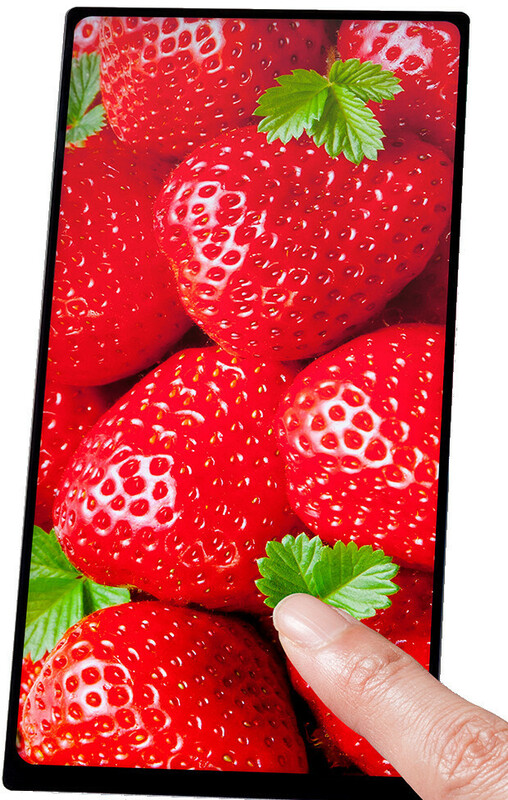 Not only has JDI developed an LCD screen that offers most of the advantages of flexible OLEDs (save for the deep blacks, of course), but it actually excels in a few parameters besides cost. JDI called its darling a Full Active display, as it managed to shrink the frame to just 0.5mm on all sides, paving the way for all sorts of "bezel-less" designs, as current LCDs or OLEDs typically have frames that are twice thicker, or even more at the bottom where the display circuitry resides. Japan Display says that it has achieved the feat by employing high-density wiring and assembly, fitting the display interface part in a fraction of the space that it used to occupy. Now, the only such panel that JDI has officially announced so far, is a 6" 1080x2160 pixels screen, and, despite that the rumored iPhone 9 display is also said to be about six inches in diagonal, we doubt that Apple will use JDI's known off-the-shelf piece. It usually works with suppliers to tailor the size, resolution, and color fidelity to its own desired specifications. Thus, the only characteristics left over by the time JDI starts shipping for Apple may be the Full Active ones - flexibility, durability, almost no bezels, and what it calls PixelEyes, encompassing technologies like in-cell touch and deeper black levels than what conventional LCDs are capable of. What this means is that the iPhone 9 may sport a pretty cool display still, albeit not of the OLED variety, allowing Apple to keep its price lower by skimping on non-essential features. Thus, the iPhone 9 may not sport 3D Touch, but it would still offer access to the Face ID and Animoji staples. By the time it launches, those features will have been hammered in the collective consciousness as iPhone exclusives for millions of people, who will have the opportunity to access them at a lower, allegedly $700 starting price. That strategy makes a good business sense, and perhaps this is why one of the most reputed Apple analysts out there predicts that the iPhone 9 will actually account for 50% of the shipments that the 2018 iPhone crop will rake in for Apple. Not bad for a lowly LCD-laden unit now, is it? Let LCD die already... Invest the money instead on OLED or other newer technologies! OLEDs need to be phased out and more investment needs to go into MicroLEDs. OLED display panels have irreversible issues with display degradation with the short lifespan of organic polymer materials that can’t be inherently overcome with more efficient material. mLEDs have the same self-emitting luminous properties, are much brighter and much more energy efficient, not not to mention, they don’t suffer from the longevity issues that organic based displays do. I'm surprised the manufacturers haven't got animals rights people chasing after them for using organic material in displays. We had a miniscule amount of animal fat in our new five pound notes and all the veggies went wild! Compared to iPhone X, the new iPhone 9 will be affordable if it starts at $700. It's probably the OLED panel on iPhone X is too expensive and drive the phone's price up. Wonder if iPhone X would cost as little as $800 with LCD screen. Wrong... It's obviously because Apple's greed.. It cost ~$300 to make one, they can sell iPhoneX for $800 and get still get lots of profit..
Gonna be a whole lotta mid range phones with this in it. Sony will get this first since they are part of JDI. Full Active Display might be embedded into the next Sony "near bezelless" design flagship at MWC 2018 or IFA Berlin 2018. Sony phones usually as a showcase to the technology that will be later adopted by other manufacturers such like camera sensors. Usually, the other manufacturers' software will make their cameras more better.